Reviewers of Korzybski's magnum opus, "Science and Sanity," have consistently criticized the author for their difficulties comprehending his work. Here are a few of their comments about the first edition from the 1934 "Book Review Digest" (page 525). "The verbosity of the work makes its evaluation difficult. One could know better what the author has said if he had not said it so diversely. But certain points emphasized by the author are unquestionably of value in a general theory of symbolism." "I believe that Mr. Korzybski's fundamental position is sound and that his obiter dicta contain some seminal ideas which undoubtedly will bear the fruit in the minds of others. But if he had deliberately set about to obscure his primary insight he could not have proceeded any differently from the way he has -- or succeeded so well." Perhaps the critics might have been more forgiving if they had known that Korzybski neither read nor spoke English until about 15 years before writing in English his 800 page synthesis of science-mathematical behavior. Clearly, if Korzybski's work were to reach a mass audience, someone would have to take up the task to translate it into language T.C. Mits could understand. 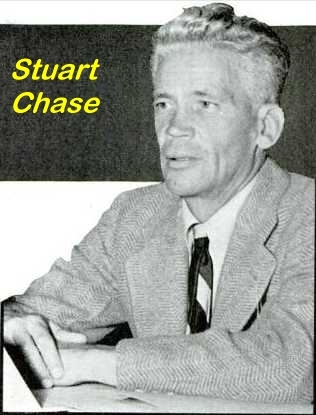 The first to do so was Stuart Chase. Chase introduced Korzybski to the nation in a series of 3 monthly articles for Harper's magazine that began with the November, 1937, issue. The following January his book, "Tyranny of Words," appeared in print and quickly became a bestseller. "Tyranny" remained in print for decades. Although "Tyranny" was an alley cat of Korzybski, Ogden and Richards, Henshaw Ward, Thurman Arnold and others, nevertheless, it served to generate widespread interest in Korzybski's work, enabling Korzybski to obtain funding to establish an Institute in Chicago. "Tyranny" also served as my introduction to Korzybski. I stumbled onto Chase's book while researching political language during the Watergate crisis in 1974. Chase whetted my appetite, and within a few months I had consumed nearly every other book he had written (and there were many). The next year I began my direct assault on "Science and Sanity." Until he encountered Korzybski, Chase was mostly an economics writer. The title of his 1932 book, "A New Deal," was adopted as the official label of the Roosevelt administration. I wrote to Chase in 1974 and he was kind enough to write back and include an autographed copy of "Tyranny." We corresponded for several years, but then lost contact. 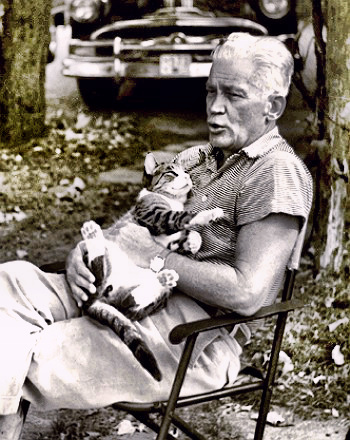 He died on Nov. 16, 1985 at the age of 97. His last book, published in 1969, "Danger: Men Talking!" continued to reflect the deep effects Korzybski had on his life. The General Semantics Bulletin, the official publication of Korzybski's Institute, made only a passing mention of Chase's death in 1985, even though he was an honorary trustee. In 1984 I met Neil Postman, editor of ETC (the quarterly publication of the International Society for General Semantics) and asked about Chase. His puzzled response led me to recount for him the historical significance of Chase to gs. Does this excerpt sound like something Chase would have written after Science and Sanity? Actually these excerpts are from an article called "Junk" that he wrote for "The Nation" in 1923 -- fifteen years before "Tyranny." 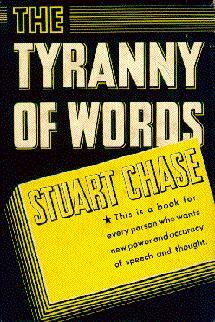 From a general semantics perspective, Chase's "Tyranny" is deficient and misleading in many respects. Nevertheless, Chase's lively prose in "Tyranny" did get many mortals like myself interested in gs, and I thought you might enjoy a taste of this historically significant book. "Corporations fill but one cage in a large menagerie. Let us glance at some of the other queer creatures created by personifying abstractions in America. Here in the center is a vast figure called the Nation -- majestic and wrapped in the Flag. When it sternly raises its arm, we are ready to die for it. Close behind rears a sinister shape, the Government.. Following it is one even more sinister, Bureaucracy. Both are festooned with the writhing serpents of red tape. High in the heavens is the Constitution, a kind of chalice like the Holy Grail, suffused with ethereal light. It must never be joggled. Below floats the Supreme Court, a black-robed priesthood tending the eternal fire. The Supreme Court must be addressed with respect or it will neglect the fire and the Constitution will go out. This is synonymous with the end of the world. Somewhere above the Rocky Mountains are lodged the vast stone tablets of the Law. We are governed not by men but by these tablets. Near them, in stain breeches and silver buckles, pose the stern figures of our Forefathers, contemplating glumly the Nation they brought to birth. The onion-shaped demon cowering behind the Constitution is Private Property. Higher than Court, Flag, or the Law, close to the sun itself and almost as bright, is Progress, the ultimate God of America. "Looming along the coasts are two horrid monsters, with scaly paws outstretched: Fascism and Communism. Confronting them, shield in hand and a little cross-eyed from trying to watch both at once, is the colossal figure of Democracy. Will he fend them off? We wring our hands in supplication, while admonishing the young that governments, especially democratic governments, are incapable of sensible action. From Atlantic to Pacific a huge, corpulent shape entitled Business pursues a slim, elusive Confidence, with a singular lack of success. The little trembling ghost down in the corner of Massachusetts, enclosed in a barrel, is the Taxpayer. Liberty, in diaphanous draperies, leaps from cloud to cloud, lovely and unapproachable. "Here are the Masses, thick, black, and squirming. This demon must be firmly sat upon; if it gets up, terrible things will happen .... Capital, her skirts above her knees, is prepared to leave the country at the drop of a hairpin, but never departs. Skulking from city to city goes Crime, a red, loathsome beast, upon which the Law is forever trying to drop a monolith, but its aim is poor. Crime continues rhythmically to Rear Its Ugly Head. Here is the dual shape of Labor -- for some a vast, dirty, clutching hand, for others a Galahad in armor. Pacing to and fro with remorseless tread are the Trusts and the Utilities, bloated, unclean monsters with enormous biceps. Here is Wall Street, a crouching dragon ready to spring upon assets not already nailed down in any other section of the country. The Consumer, a pathetic figure in a gray shawl, goes wearily to market. Capital and Labor each giver her a kick as she passes, while Commercial Advertising, a playful spirit, squirts perfume into her eyes. "Such, gentlemen, is the sort of world which our use of language fashions." Stuart Chase, "The Tyranny of Words," p. 23-25.